With rising prosperity of the Chinese population, there is an increased demand for animal-based food, in particular for milk, beef and pork. Hence, China would like to increase efficiency and sustainability of its domestic production of milk, beef and pork. To develop Chinese cattle and pig farms, the Chinese partners want to use German genetics, technology and experience of optimizing the production process of the milk and meat production more effectively. Thereby, Chinese cattle and pig farms shall improve their performance, quality and resource efficiency as well as their husbandry conditions and animal health. At the same time, the economic and technical cooperation between the two sides shall be deepened. The project foresees the cooperation with up to ten Chinese cattle holdings of the breeds Holstein, Simmental and Brown Swiss in Beijing, Hebei, Heilongjiang and Sichuan provinces as well as autonomous region Xingjiang and at least two pig farms. 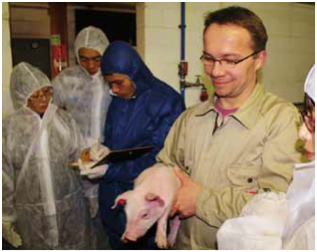 The project is embedded in the German-Sino Center for Technology and Innovation in Animal Breeding. 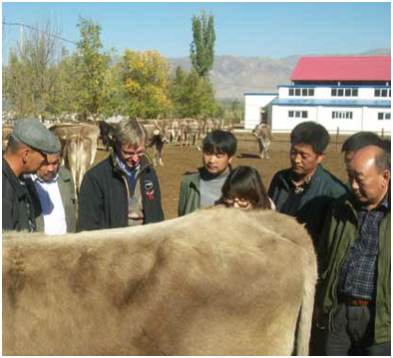 The Chinese project office at the National Animal Husbandry Service (NAHS) is responsible for the implementation of the project with demonstration farms in various provinces of the country. For the newly added project component pig, but also for the project component cattle more business partners will be identified in 2016. The project (project No. : CHI 15-01) is sponsored via the GFA Consulting Group GmbH with funds from the Federal Ministry of Food and Agriculture (BMEL) and co-financed by business partners.